Debris disks are optically thin circumstellar disks around mainsequence stars, comprised of micron-sized grains. The dust is generated from destructive collisions of planetesimals, induced from gravitational perturbations by large planets. Debris disks can as signposts for planetary systems, through which, a universal picture can be obtained that encompasses the evolution and architecture of the Solar System’s own dust disk and planetary system. The dust in these disks can be detected by their thermal infrared flux, measured as an excess above the photospheric emission. Dust at different circumstellar locations, inferred from the peak wavelength of the detected emission, can act as a probe for local dynamical activity in the system. Over the last thirty years, cold disks, analogous to the Kuiper Belt, have constituted the bulk of debris disk detections. Warm disks, analogous to the Main Asteroid belt, can act as signposts for dynamical activity in the terrestrial planet zone, but are rare in contrast. The Wide-Field Infrared Survey Explorer (WISE) space telescope mapped the entire sky in two near-IR and two mid-IR bands in 2012. The two mid-IR bands are well placed to probe dust emission in the terrestrial planet zone of these stars, at sensitivities greater than the last all-sky IR survey in 1983. WISE also provides us for the first time an opportunity to contemporaneously measure the photospheric and IR excess wavelengths of the entire sky, increasing sensitivity to fainter levels of dust. In this thesis, I present an unbiased survey of warm disks around main-sequence Hipparcos stars in the solar neighborhood, detected using data from the WISE All-Sky Database. Our series of surveys builds upon each other to find previously undetected faint, warm debris disks by including bright photometrically saturated stars in WISE, using empirical photospheric colors, removing several non-trivial false-positive sources, and verifying and validating these detected excesses. 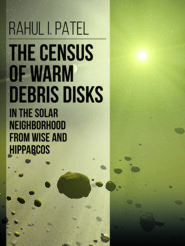 This thesis adds a substantial number of new disk targets to the census of debris disks, as well as an assessment of the incidence rate of WISE disks in the solar neighborhood. The number and rate of detections can ultimately aid in enhancing our understanding of the formation and evolution of planetary systems.